1 What Causes Dark Circles Under Eyes? 2 How to get Rid Of Dark Circles? A twinkle in your beautiful eyes can make your face shine like a pearl. Could you Guess what others notice about you in the very first look? Yeah! It is nothing but those Dazzling Eyes. The reason behind this is our eyes speak much better than words. So, To make your first impression the best one, keep your eyes bright and blemish Free. Dark Circle and Puffed Eyes will convey your ill health to others. Even some of the most stunning women also have to lay money on concealers and makeup to hide their Dark Circles Under Eyes. The under-eye circles not only make you look older than what you are, but they also make you look ill and unhealthy. A good soulful sleep can reduce dark circles around eyes and Puffy eyes effectively. Low Iron and Haemoglobin Levels. 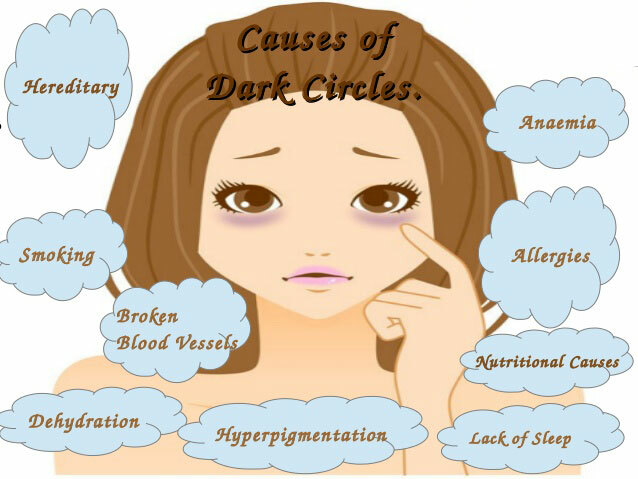 Before Treating Dark Circles Under Eyes, Know the Causes of Dark Circles. So that the treatment becomes easy. How to Reduce Dark Circles under Eyes? There are two ways to treat Dark Circles Under Eyes. It includes both Natural and Chemical ways. You can mask your dark eyes using many Creams and Concealers. But those methods can cause extensive damage to your Sensitive skin under your eyes. So, it is always better to prefer natural ways to treat. Of course, the natural processes may take a long time to heal, but you can save your skin from the Harsh chemicals. The home remedies are age-old methods which recover naturally without side effects. So, let us take an oath to soothe our body in an organic way. Check out the tips to Reduce Dark Circles Under. Most of us might love those tiny drops of Sour Lemon, Lemonade, Lemon Chicken, etc. But Do you know the fact that even your skin and hair loves the lemons too? The Lemon offers a broad range of Beauty Benefits when consumed or when applied topically. Lemon Juice is the Best of all remedies that you can use for removing the Blemish. The reason behind this is the Bleaching Property of the Lemons. The vitamin C present in Lemons nourishes and repair the skin and you get rid of of Bags under eyes. Dip a cotton ball in fresh lemon juice and apply it carefully around your eyes. Leave it for about 20 minutes and rinse it off. Repeat this once daily for few weeks. 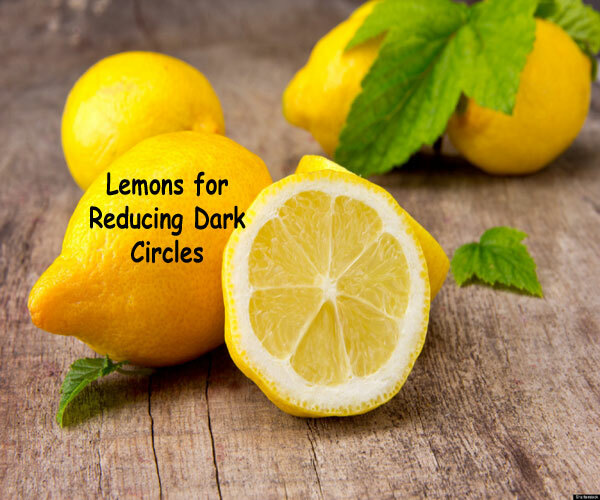 Mix Lemon Juice and Almond oil together and apply it on the Dark Circles under Eyes. Add one part of lemon juice, two parts of tomato puree, a pinch of gramme flour (besan) and turmeric powder. Apply this gently around your eyes. Rinse it off with clean water after 10 to 15 minutes. Repeat this twice or thrice a week. Note: If the lemon juice might cause a burning sensation when it touches the inner eye. Castor Oil rejuvenates the dull skin and makes it look healthy. It contains fatty acids, which helps to refresh your skin. The action of the Castor Oil is due to the presence of Ricinoleic acid present in castor oil. It has anti-inflammatory properties and which likewise makes it an excellent remedy for puffy eyes along with the dark circles Under eyes. Apply the castor oil on dark circles under eyes in Bed Time and massage gently and leave it overnight. Wash it off in the morning. Mix Castor Oil with Fresh cream. Wash your face with a cleansing agent. Apply the mixture all around your eyes. Wash off with water. Repeat this Daily for best results. Yes, What you have read is true. Buttermilk has the properties which reduce Dark Circles Under Eyes. It may sound a little weird. But, Buttermilk is a rich in probiotics and lactic acid. Lactic acid can shed skin to give it a radiance. The acidic and astringent properties of buttermilk can cure under eyes circles. When Buttermilk is provided in combination with turmeric, it shows anti-inflammatory nature which can also cure bags under eyes. Turmeric- Just a Pinch or two. Buttermilk- 2 tsp( Thick State). Add Buttermilk and Turmeric into a small bowl. Most of us have known the fact that caffeine-containing products can treat eye problems. 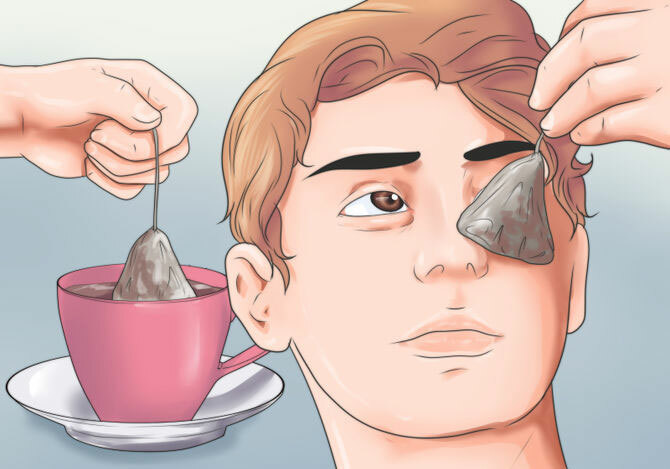 The antioxidants in tea bags make it an excellent remedy for treating dark circles and reducing puffiness. The caffeine content shrinks blood vessels and reduces the fluid retention in the tissues around the eyes. It contains tannins which stimulate blood circulation. Tea contains theophylline which decreases the subcutaneous fat. It contains alkaloids that promote the healthy skin growth around the eyes. Therefore, Don’t miss this super beneficial product if you are vexed trying other Dark circle removers. Hold the tea bag and dip it in the hot water. Let it sit for 2-3 min in the Hot Water. Remove it and drain the water completely. Let in cool in the refrigerator for 20-30 minutes. Remove it and put it on the eyes for half an hour. Note: Flavoured Tea bags are not Preferrable. You’ll witness a noticeable improvement in puffiness and under-eye circles. Be careful not to get tea in your eyes. 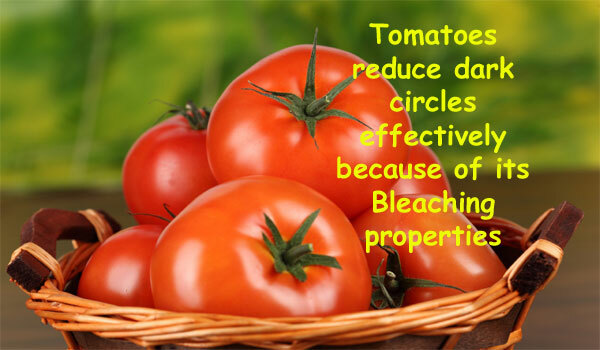 Just like Lemons tomatoes also possess Bleaching Properties. Therefore, the people who are allergic to lemons can replace them with these red fruits. Tomatoes are effective in removing dark circles, and also makes the skin soft. Mix one portion of tomato juice with half portion of lemon juice. Gently apply this mixture on the dark circles and allow it for 10 minutes. Rinse it with lukewarm water. Repeat this regularly for few weeks. Blend one tomato into a fine paste. Add few drops of lemon juice, a pinch of turmeric powder and two spoons full of Gram flour. Mix all the ingredients well. Apply the mixture on the dark circles. Leave it for around 20-30 minutes. Later wash it away with warm water. Repeat the same tip for twice or thrice a week. Milk is known for its cleansing activity. It moisturises the skin and helps in rejuvenation. Vitamin D contributes to restoring the skin’s elasticity. Milk contains Retinol and B6, which play a vital role in formation new skin cells. The selenium in milk guards skin free radicals and sun damage. Soak two cotton balls in fresh, lukewarm milk. Squeeze the excess amount and place over dark circles. Leave it as such for 20 minutes. Remove cotton balls and rinse with fresh water. Repeat this every day regularly for better results. Mix cold milk and rose water in equal amounts. Soak cotton pads in the mixture and Squash the excess mixture. Place them on your eyes and leave on 20 minutes. Remove them and wash with cool water. Note: Blend milk with fresh rose petals if you like. Mix 1 part of the Milk with Quarter fresh lemon juice until the milk curdles. Add one spoon full of honey. Gently massage around the eyes for 5- 10 minutes. Rinse with ordinary water and Repeat daily. It is a well known super easy home remedy for dark circles. Almond oil, being a rich source of nourishing vitamins, it can be used in removing Dark Circles Under Eyes. It lightens the skin. Just massage the affected areas Almond oil daily. It can reduce the occurrence of dark circles. The vitamin E in the almond oil will rejuvenate the skin, with regular use. Regular use of almond oil will also assist in reducing crow’s feet and wrinkles. Gently massage almond oil around the eyes during nights. It gives visible results by reducing the dark circles. The blood circulation will be increased by massage, and it gives amazing results. Due to dehydration, the skin becomes dry and dull. The dehydrated skin can be balanced properly by applying almond oil on the skin. Mix two parts of honey and two parts of almond oil. Apply the mixture every night in the affected areas. Mix Sweet almond oil with milk. Apply this to the area under the eyes. Milk gives amazing results and also provides moisture to the skin. Add the almond oil to the mashed avocado mixture and blend it. Dip a cotton ball into this mix, and apply it over the closed eyes. Leave this mixture for 15 minutes. Rinse with cold water after application. Have you ever wondered why the people in the Beaches are seen relaxing with a slice of cucumber on their eyes? Well, there’s a reason for that. They have plentiful amounts of Anti- Oxidants. Cucumber has skin-lightening and mildly astringent properties which can fix your many eye problems including Dark Circles Under Eyes. The colder the cucumber slices, the better are the results. Place the cucumber slices in the freezer for at least 30 minutes before using them. 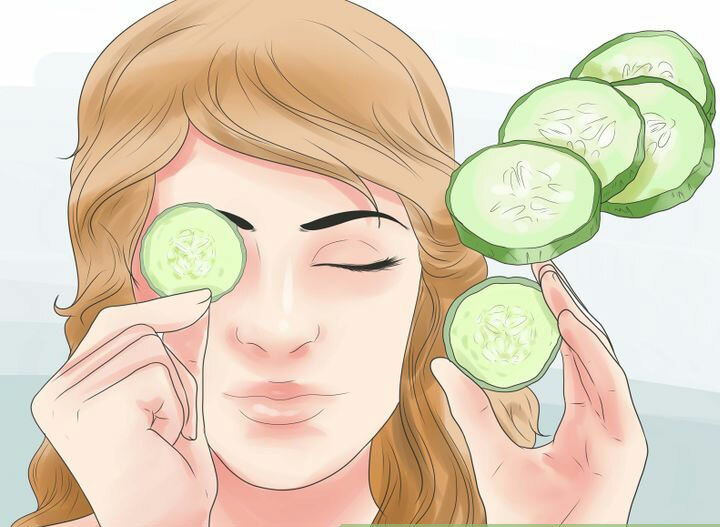 Place a cucumber over each closed eye. Cut a cucumber into thick round slices and refrigerate it for about 30 minutes. Place the slices on the eyes for about 10 minutes. Allow it for at least 15- 20 minutes. Follow this regularly to get rid of Dark Circles Under Eyes. Place thin slices over the eyes for around 10 minutes which lighten the skin, causing bruise-like circles to fade. Grate a medium sized potato and strain it through a Muslin cloth. Collect the fresh juice from potato and apply it in the affected areas. 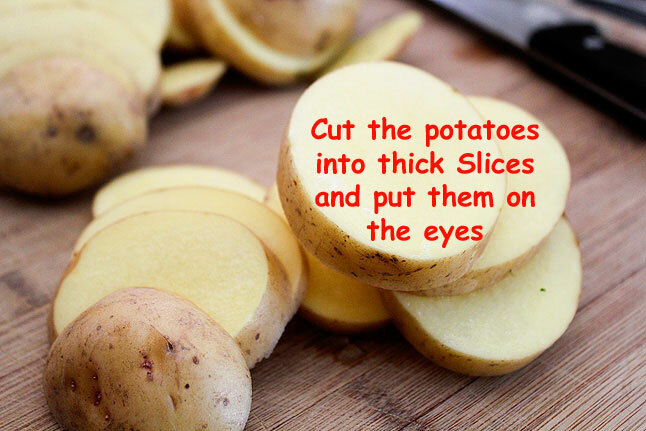 Cut the potato into thick slices. Refrigerate them for 30 minutes. Place them on your eyes and allow it to sit for 20 minutes. Rinse your face with warm water and repeat the step daily. Peel and grate a potato. Add olive oil and honey in equal quantities. Blend them finely. Apply the potato mixture on the dark circles and allow to dry for 15 minutes. Mix 1 portion of potato starch powder, one pinch of barley powder, and ½ of a banana until smooth. Apply to Dak circles under eyes. Leave it for 20 minutes. Rinse with fresh water. This essential water also helps you in treating Dark Circles under eyes. 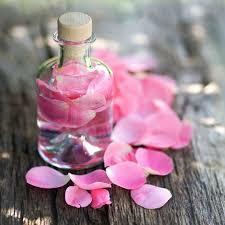 Rose Water is prepared by soaking rose petals in purified water. It has a broad range of uses. Rose water is often considered an excellent remedy for reducing dark circles. It instantly refreshes the tired eyes and also reduces puffy eyes. Rosewater soothes stressed under-eye skin and hydrates. It restores the skin’s pH balance to reduce excessive pigmentation. The anti-oxidants in rosewater strengthen and regenerate skin cells which help to remove Dark Circles Under Eyes. Spray a mixture of fresh milk and rose water in a bowl. Leave this for at least 10 minutes on your eyes. Rinse your eyes after 20 minutes. You can notice a visible change within 3 – 4 weeks and get rid of Black circles. Apart from these home Remedies, personal care is vital. Things to avoid Dark circles are listed below. Just follow them if necessary. Never go to bed with your eye makeup on. Always use a good eye makeup remover. If you work on the computer/ Laptop, just look away from the screen every 20 minutes. It gives relaxation to your eyes. Splash cold water on your eyes. It helps in relieving the tension and stress. Never wear contact lenses for prolonged hours at a stretch. Eye exercises also help to relieve stress. Maintain at least 6 feet distance from TV. Eat foods that improve eyesight. Vitamin A is good for eye health and vision. Never look at the bright light directly. Healthy Sleep is essential. Our body needs a good sleep for about 7 to 9 hours per day. Lack of sleep is the primary cause of dark circles. Avoid drinking and smoking to prevent under dark eye circles. Do not use too much makeup or chemical bleaching around the eye area. Consume Vitamin B, E and iron regularly. Consuming Vitamin E will help in reducing dark circles. Vitamin C plays a critical role in improving skin health. If you do not add enough vitamin C in your diet, you will be at a risk of having unhealthy Body. If it is regularly used, you can see a fresh glow on your skin every day. Add oranges, lemon or grapefruits also to your daily diet. 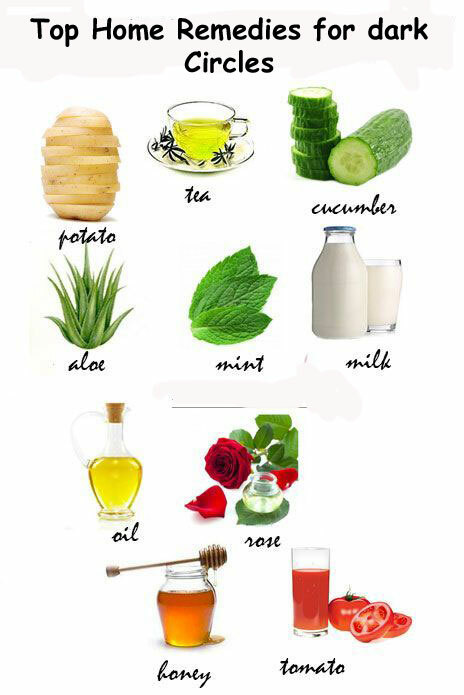 Therefore, Adopt any of the above mentioned top 10 Home Remedies in your routine. These DIY methods are very simple and consume less time. To see a great result, it takes some time. But never give up. Remember, Rome is not Built in a Day! So, be patient and you can see the best results without spending a single penny on costly cosmetics. All the Best.